This morning, armed with good intentions, we all walked down to the allotment determined to make serious inroads into the mess in the centre of the top plot. Leaving a sleeping baby in the pram by the shed, my husband tackled the grass whilst I went up and down the top plot attempting to rid it of weeds and yet more grass along the edges. Mick who has the plot next door asked us to get rid of the grass as it was seeding on his plot. It’s taken a week and we have got rid of half of it. It’s an absolute beast to remove! I cleared weeds away from the bottom of the top plot in preparation for replanting the seedling raspberry plants which have appeared in the shadow of the worlds most productive raspberry bush. These will be replanted tomorrow on the bottom plot to fill in the gaps where the current raspberry plants are. We made a stop for lunch – my husband ran off to the shop to get some drinks and to try and get the increasingly grumpy baby back to sleep. It didn’t work. So we picked her up and walked a couple of minutes down the road to the local chippy. Half an hour later, with lunch demolished, we went home to sort out the hot and angry baby and to do a few jobs before I headed out again. The second session today focused on the bottom plot, finishing clearing the raspberry bed and into the next bed and onto the path, removing the wooden planks which we had laid out last year to form beds. Having piled these up on the side of the chicken coop, I preceded to lob all the weeds I could manage to gather into the coop. Much clucking and scratching ensued, with all four Warrens busy enjoying the feast. 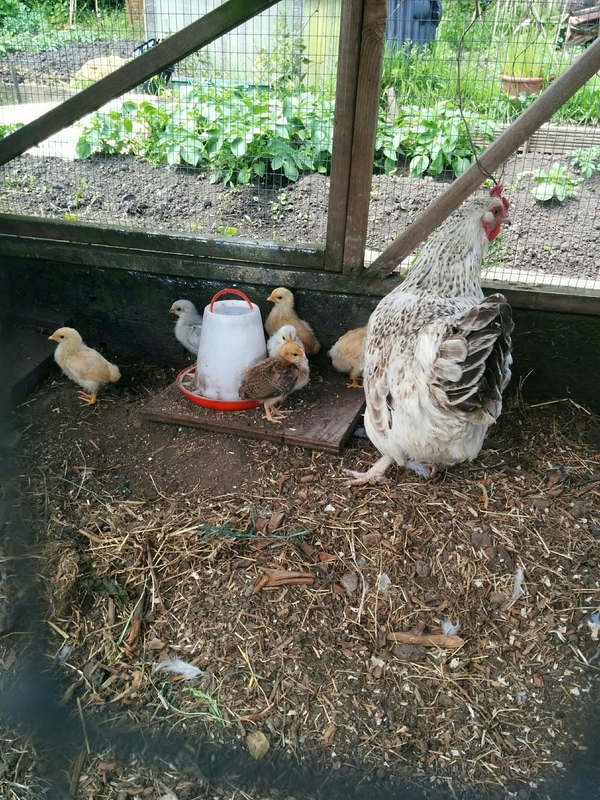 I also went to check on Emily and her eight little balls of fluff which seem to have become so much bigger in the last week! They are of several different breeds and it definitely looks like she has her claws full! So the plan for tomorrow? 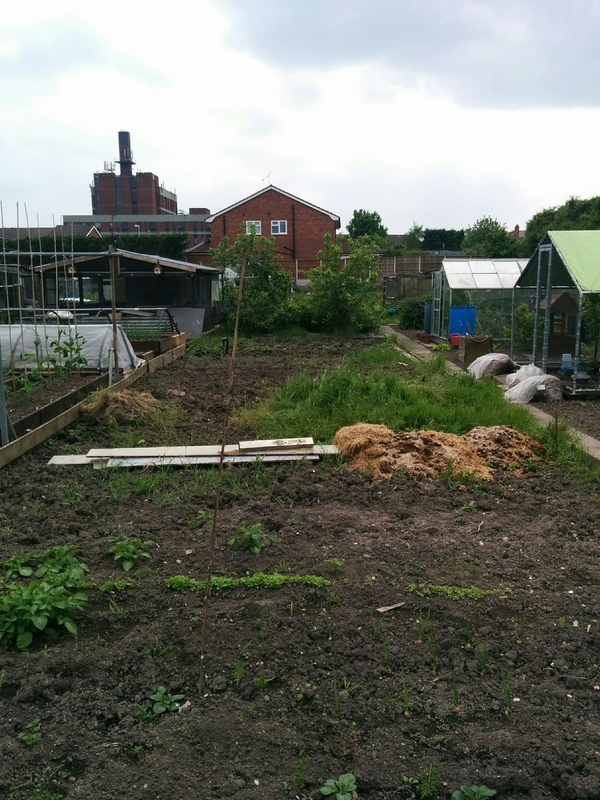 Finish getting rid of the grass on the top plot, replant the raspberry seedlings, plant the runner beans and carry on ferociously getting rid of weeds…. Wow, you’ve been busy! 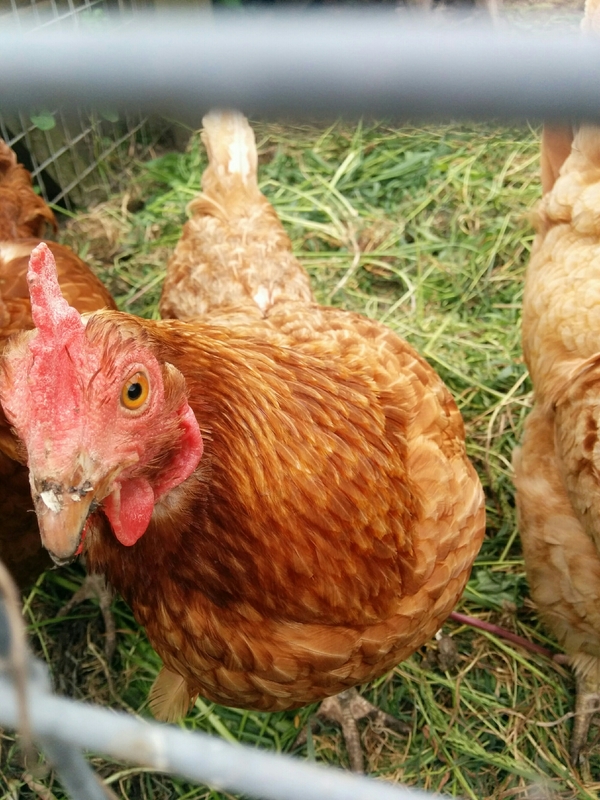 I can’t wait to get our chickens down to the plot, it’ll be a nice change of scenery for them. Our little girl gets grumpy at the allotment too, though she’s in the terrible twos rather than a baby. I am not sure why my little one gets so frustrated except that she is teething currently. Masses still to do though!